This PDF 1.3 document has been generated by Microsoft Word / Mac OS X 10.6.8 Quartz PDFContext, and has been sent on pdf-archive.com on 26/07/2017 at 04:01, from IP address 203.45.x.x. The current document download page has been viewed 191 times. File size: 254 KB (8 pages). 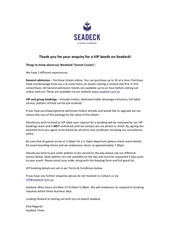 Thank	you	for	your	enquiry	for	a	VIP	booth	on	Seadeck! service,	platters	of	food	can	be	pre-­‐ordered. reduce	the	cost	of	the	package	by	the	value	of	the	tickets. for	exact	boarding	times)	and	we	endeavour	return	at	approximately	7.30pm. to	your	event. Please	email	your	order	along	with	the	booking	form	and	full	guest	list. 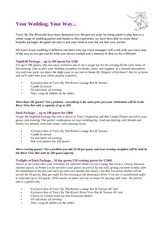 VIP	booking	details	are	set	in	our	Terms	&amp;	Conditions	below. requests	within	three	business	days. Looking	forward	to	setting	sail	with	you	on-­‐board	Seadeck. signed	and	submitted	a	minimum	of	five	days	prior	to	the	date	of	the	reservation. Please	send	full	guest	list	along	with	this	form	to	the	team	in	order	to	proceed. the	initial	number	booked. Tickets	and	table	bookings	are	non-­‐refundable. will	be	deducted	from	the	attached	credit	card. set	out	by	Seadeck	management	and	in	accordance	with	NSW	licensing	laws. of	bookings. All	guests	are	required	to	have	valid	ID. Captain	believes	the	safety	of	the	vessel	or	passengers	is	at	risk. *For	all	table	packages	a	10%	service	charge	is	added	to	the	final	bill	as	a	gratuity. anchored	and	if	there	is	no	wind. increase	of	price. We	will	consider	larger	group	numbers	on	a	case-­‐by-­‐case	basis). extra	guests/tickets. A	full	guest	list	is	required	in	an	email	upon	returning	this	form. *Any	pre-­‐ordered	platters	must	be	confirmed	via	email. Your	social	media	link	is	required:	www.facebook.com/_______________________. pre-­‐ordered	5	days	prior	as	they	are	not	available	on	the	day. with	fresh	baguette	&amp;	grissini. Mozzarella	and	a	classic	American	cheese. grilled	steak	with	chimichurri	&amp;	tempura	eggplant	with	avocado	puree. This file has been shared by a user of PDF Archive. Document ID: 00628781.